I have decided to take up some valuable space with a look at the construction process itself. 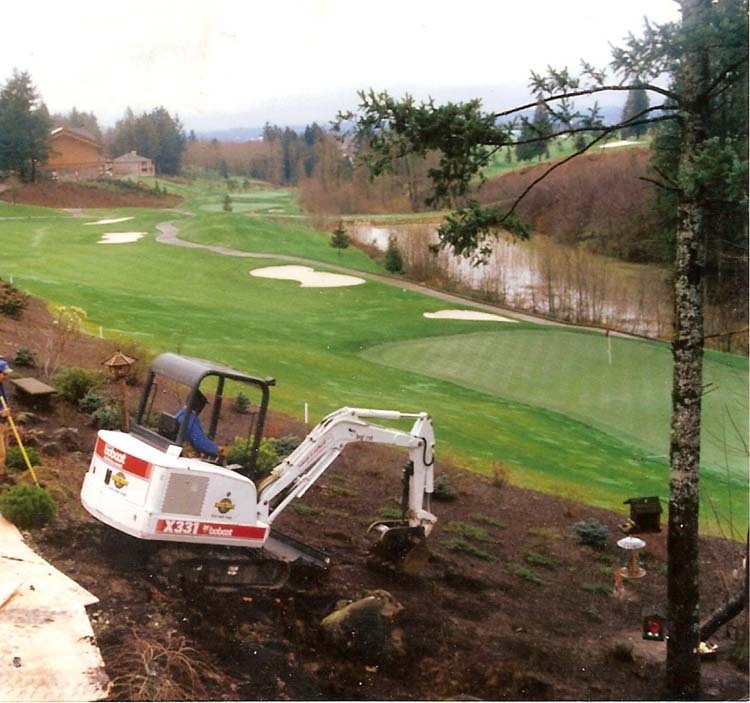 We acquired this project from a family who lived by a golf course and who correctly surmised that the sounds of water spilling would be satisfying, yet, in great amounts, loud and obnoxious. As a sound issue water is a most penetrating sound. It can literally “drown out” conversation, if you will. We designed this for the sound and of course, the visual effects, yet pointed it away from the house itself. We begin. 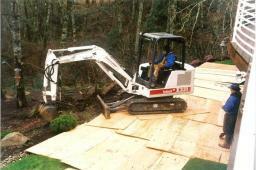 We have placed plywood on the ground, more to protect irrigation parts and to keep the mud and mess to a minumum than anything else. It is time to begin the excavation and we are beginning at the top, as is usually the case on a bank. We venture downward, excavating our original hole, determining drop areas and depths of retaining ponds. This stage just has us digging the original hole. 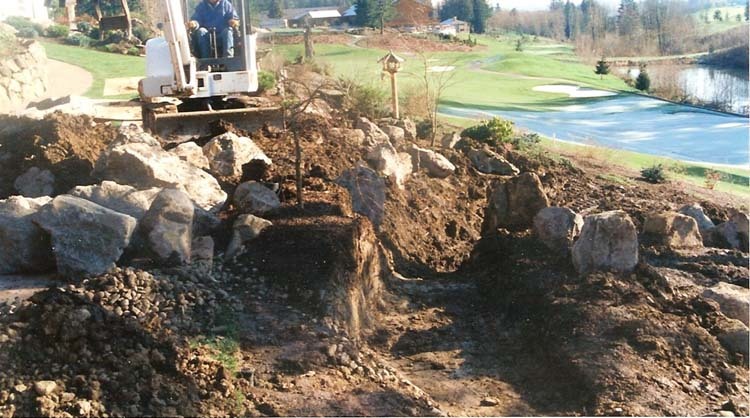 Later pictures reveal a bit more method as we begin placing the more major boulders, the anchors, at specific points. I typically “anchor” my falls, when possible. The idea is to act like Nature. 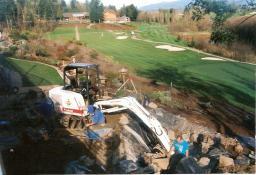 For example, creeks turn when they meet large immoveable boulders. Likewise for the formation of water features. As in Nature, a sudden dropoff is usually around major, relatively immoveable obstacles and grade changes. This is what I try to reconstruct. At this stage, we excavate first. It does not take long to get at the nuts and bolts. Turns out, digging is the easiest part! Here, then, is your standard average big old hole in the ground. By any other name, that is what it is for sure. 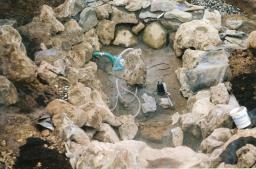 There is however some method to this excavation. 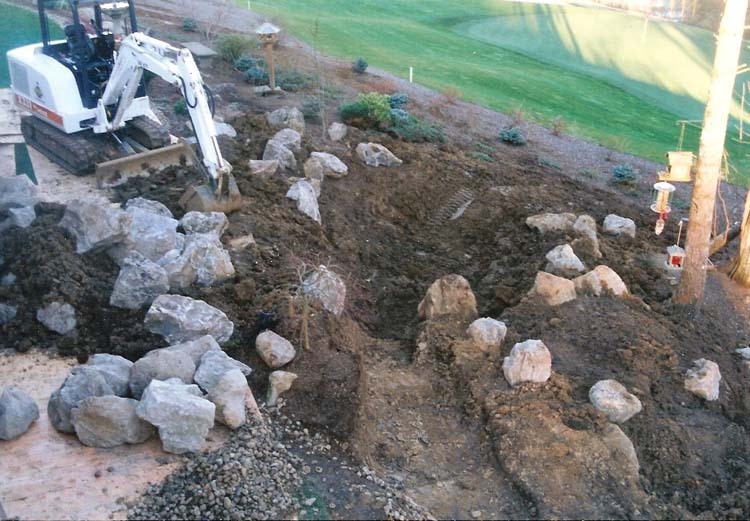 As we excavate our way down, we create “falls ledges”, designed spots where the various falls will take place. Notice the anchor rocks by the lower, and final in this case, falls. The liner will not be under these. Their sheer size of the boulders would cause rips in it, a fate to be avoided at all costs. In the end, holes in a liner are a disaster. This particular system we applied concrete to throughout, over the liner, adding an extra measure of security if you will. However, we often use liner only, as Part 5 will illustrate. We often add an underlayment, a fabric under that. The reason? Well, many. 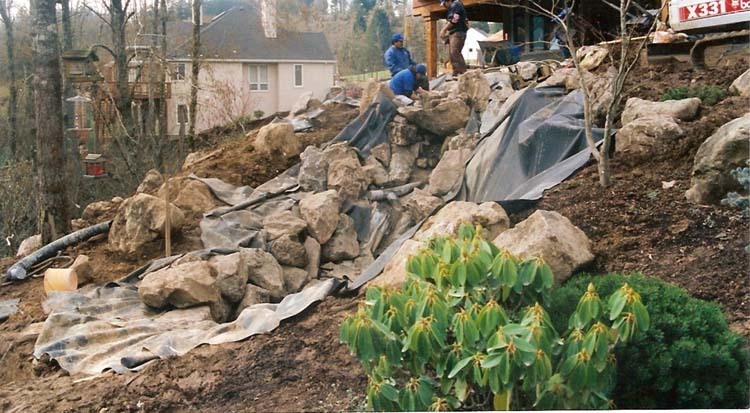 One is the softer subsurface adds some padding for any potential objects which could affect the liner, like rocks and feet. Another is that the maddening little critters, both moles and their cousins in “liner crime” the “voles” both enjoy the salty taste of liner. Yes, I swear. We have had liners we traced holes for only to find these teeth marks at the end of small critter tunnels. Turns out, the salts in the rubber are somewhat tasty to the little munchkins. Ugh. This is actually progress at the same stage as the former picture, yet this is from another angle. One gets a much better idea of the anchor rock idea, noticing those two large rocks that straddle the lower falls. As well, this view allows us to back up and see the starta which is above the bottom pond. It will be another pond, the second in a series of 3. OK, now we are getting somewhere. 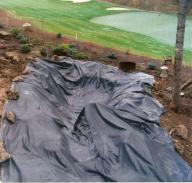 We typically lay the aforementioned underlayment beneath the liner pictured here. This liner is an EPDM, 45 mil. liner, which is very tough and quite heavy. We protect our liners as much as humanly possible, because in the end, these sheets of rubber are what holds the water. One is wise to double or triple smaller pieces of liner when placing larger rocks on top of it. 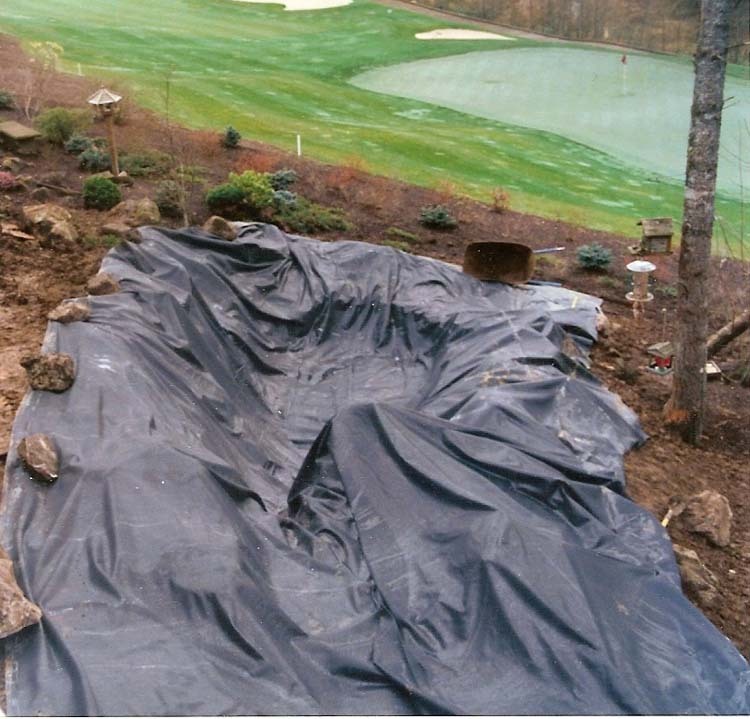 This “protection” keeps the contractor from palpitating when someone drops a rock on his precious liner. Repairs are actually easy, if indeed one does discover a hole, or rip in the liner. We use an EPDM glue, much the same as that glue used on bicycle tires. Equally smelly and equally needing to dry first before application. We use alcohol to clean the surface we mend, and rough it up, slightly with sandpaper or our hands. Pressure is needed to hold it in place, which often represents one’s hardest task. We begin adding cement and the rocks which will form the feature itself. Obviously, I rely heavily on the machine in the picture there. The virtue of these small “mini excavators” is in their “thumb”, the small attachment that squeezes a rock between itself and the bucket and can drop it into place at a distance. Inasmuch as many of the rocks are dense and heavy as heck, the machine is worth it’s weight in gold. “Work smarter, not harder” is heard alot in my trade. The ability to add rocks in place like a jeweller is a good analogy, just on a much larger scale. We are now doing things like providing the “spill rocks” over which the water flows. Great pain is taken to get those that will give the efffects we are after. We were very desrious of having a “sheet effect” on the upper falls, which would also be the tallest and biggest drop. Nearer the bottom, we opted for a more natural, creek effect. The cementing is primarily finished, rocks in place and the pumps placed. 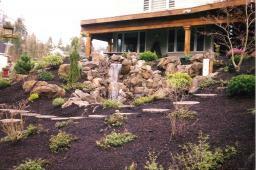 Note, on this water feature we added a “bubble rock” in the bottom pond, thus the need for the additional, smaller pump. The piping and routing of the pipe back up to the source of the running water was achieved during the process of setting the rocks in place and cementing. At this stage, we are ready to actually run the water for the first time. It is always fairly exciting after all the hard work of moving and rassling with big rocks, to see what the heck we were aiming for and how close we came. It usually draws a crowd. I might add that this stage also performs the function of showing us where we might have gone wrong, what requires tweaking and adjusting. Still, this is about the 85% finished mark, any way you slice it. OK, we are running the thing. 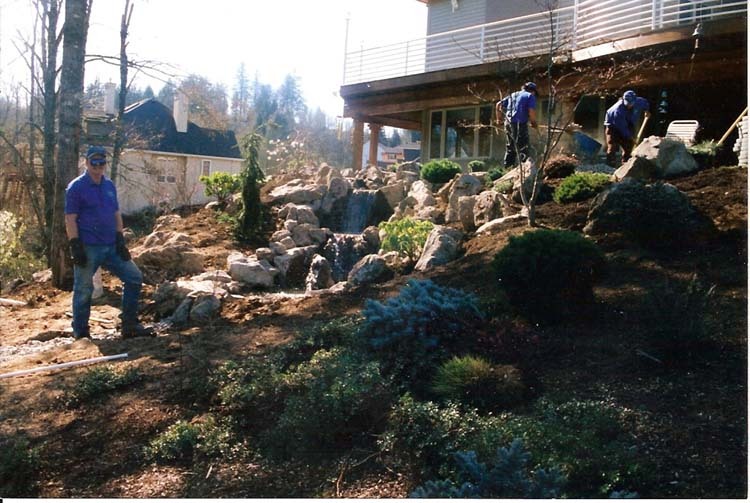 We were tweaking some stuff and actually replacing and moving some of the plants surrounding the feature at this juncture. The falls and creeks, the pumps and pipes have all been checked and adjusted appropriately or repaired, it is ready to roll. Here she is! Planted up, with lights inset beneath the falls and all the bells and whistles. This was a really fun job to do, with not as many snarly tangles as many we have done. The soil was easy to excavate and the homeowner was a great guy who was fascinated by it all and who took many of the pictures I have here. This waterfall did win an award in the state it was contructed. That is great! I would love to take on a project that size. Just think that it is so beautiful and they do not have to mow!! Wow too thumbs up, very good job, lots of work and details to accomplished that kind of work, i’m happy that you received an award, sometime it’s give us a boost to get recognized in the hard work of creations. I love the way you integrated your knowledge of natural falls and how they behave with your innate artistic sense and knowledge of plants. I never would have thought about moles and voles though I battle them every year. I certainly regret having a flat property as I have always loved waterfalls and dipping my toes into a stream. I appreciate the technical details and thought that went into the details. This owner is certainly fortunate to have one of your designs! 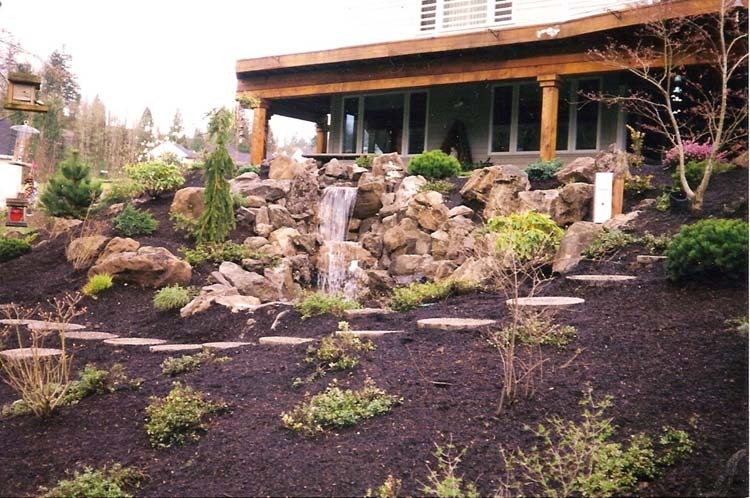 Your landscaping pictures are just so awesome! I was just mentioning my Vandusen Botanical Gardens, weeding dandelions, to clean the lawn seeds out! I was taking tomy nephew in law, as an example of capital forming compounding multiplication of production, to or from any kind of compounding product! Those seeds were vital to the process! An older Chines gardener at the Gardens, told me ,we have to get rid of the dandelions, before they sprout seeds! So we had to weed them, before they turned white! He showed me the spots, they had effectively weeded, in the course of years, going up till that point! It was real interesting for me, as a teenager, on work study, summer time employment, through the Total Ed school! This page you have shows big heavy machines! Is that your plant & equipment capital? This is such a wonderful work of art! I appreciate the fact that you designed this for the sound and of course, the visual effects, and pointed it away from the house. Your work is beautiful and well-planned. I agree that the owner the house is certainly fortunate and happy to have one of your eloquent and expressive designs.